Queen's University has a long tradition and history of quality and excellence in sports and recreation – from the early recreational activities of the mid-1840s to the introduction of formalized sport in the 1880s. Fully supported by the University in our pursuit of excellence, Queen's Athletics and Recreation seeks to become the leading athletics and recreation program in Canada. Today, the University has one of the largest post-secondary competitive and recreational sports programs in the country – significantly higher than any other Canadian institution of comparable enrollment. 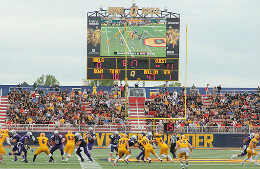 Thousands of Queen’s students participate in athletic and recreation programs each day. Through various giving opportunities, donors can help us offer the services and support that student-athletes need to excel and be successful both in the classroom and on the field of play.